This list only picks out a few highlights of our visits, and doesn't mention the numerous social events our members enjoy throughout the year. Each year we have around six social events, taking place either around a lunch or evening meal, with various entertainments. The style of the events changes but the highlight of the year is the the old year night's dance, with music by Barry Lee. It was hard to believe that two years had passed since our last visit. 26 Aylsham Twinners travelled by coach and together with 12 more independent travellers, we were met by committe chairman Muriel Le Chalony. The following day we visited the Cléry St André Basillica followed by a picnic lunch and then onto the Cuvler Museum dedicated to bicycles. A wonderful day was spent in Blois discovering the Boule de Fort game (unique to the Loire Valley) where the boules are delivered on a curved track. We were delighted to beat the Chausséans and the pig was brought back to Aylsham strapped to the front seat of the coach. Later that evening we were given a tour of the Carroir, a newly built community hall and theatre in La Chaussée. There was also a visit to the Botanical Gardens at Tours followed by a picnic lunch, a visit to the Trade Guilds Museum and a trip on the tourist bus. Our evenings were spent eating delicious food, drinking excellent wines and making and cementing 'old' friendships. The final event, the official twinning dinner, came all too quickly. Our hosts were invited to visit us in Aylsham in August 2019. Summer Garden Lunch - This was another great event. The weather was good, the food was delicious and the company, as ever was scintilating. We were also wonderfully entertained by the Broadland Ukelele group. They played a variety of tunes from traditional to rock and roll. They are certainly worth asking again. Many thanks to John and Charlotte Wootten for the use of their house and garden and for supplying the Kir and canapés. Once again the sun shone on our Brocante. Some people made some money, some got a bargain or some just had a chat and a cuppa. Another successful event. This was a very enjoyable evening. We started with a video presentation of some of our previous events. We then had an assortment of delicious pizzas and some mouthwatering desserts. The evening finished with a quiz supplied by Amanda. Many thanks to those who contributed to the evening. Another fun day out at the Cromer Pier Show. A trip to a matinee performance of the only end of pier variety show in the world, at least that is what they say and who are we to argue. A traditional variety show with some singing, dancing comedy, magic and juggling. The show was followed by a delicious fish and chip supper at No. 1. We even managed to avoid the disturbance in Cromer that day, they must have heard we were there and decided that discretion was the better part of valour. Our Summer Garden Lunch was as popular and enjoyable as ever and a good time was had by everybody who attended. Many thanks to Mike and Sue for the use of their lovely garden. If you missed it this year try to go next year as it is a lovely event. Another wonderful visit with many old friendships being renewed. Although there were less visitors than usual, this did not stop everybody having a marvellous time. We had a lovely relaxed afternoon and evening at Top Farm with a delicious meal. Our visitors won the bowling for the pig so we must be more determined than ever to reclaim the porker next year. An interesting visit to Van Dal shoes to learn about shoe making was followed by a visit to the lovely Plantation Gardens. A garden party at North Walsham Catholic Church passed a relaxing afternoon. The final activity was a visit to Houghton Hall followed in the evening by the celebration dinner in the Town Hall supplied by the Black Boys. There was plenty of free time for hosts to spend with their guests which made for a relaxing time. All in all a good time was had by all. 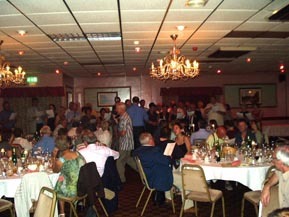 The return visit to La Chaussee next year will be from 18th to 23rd September so make a note in your diaries. This was another wonderful Hogmanay party where everybody had a great time, with fun and games and super music from Barry. A terrific way to welcome in the New Year. Our Summer Garden Lunch was another extremely enjoyable afternoon. Many thanks to John and Charlotte for being such wonderful hosts. Also thanks to those who erected the tents and prepared the lovely food. The Bowling For The Pig was won by Mike Bush, who now has the honour of keeping our prize porker well fed and watered ready for next year. 33 members have just returned from a very relaxed and enjoyable visit to our friends in LCSV. As always, we were well entertained with visits to the recently opened Loire Observatoire, the Chateaux at Selles sur Cher, the Matra Museum and attending the local celebrations and firework display for Bastille Day. Finally, the Official Twinning Dinner, where a delicious meal was served and speeches made. Carole Matthews laid a wreath at the local war memorial on behalf of the Aylsham Branch of The Royal British Legion to commemorate both the French and English killed at the Battle of the Somme. The weary travellers arrived back in Aylsham with smiling faces and many happy memories. This was another well attended event. The weather was kind to us and we all had a great time. People brought their own food for cooking on the barbecue but a great selection of salads and many delicious desserts were supplied for the enjoyment of everybody. Thanks to those who supplied the aforementioned and also to Pam and Derek for hosting at Home Farm, Marsham. Also thanks must go to those who set up and dismantled the party area, and manned the barbecues, an important but sometimes overlooked job. Another successful Brocante took place in Blofields Loke. The weather was good to us and there were many stalls selling a variety of goods with plenty of eager customers snapping up bargains or having some tea and cake and a good chinwag. This looks as if it could become a regular feature of Aylsham life. This was a wonderfully enjoyable afternoon. The weather was kind, the food was delicious and the company excellent. What more could you ask for? The Bowling For The Pig was won by Derek Bailey and the porker has taken pride of place in his conservatory. Look after it well Derek, we will need it next year. Many thanks to Mike and Sue Bush for their hospitality and allowing us to use their lovely garden. Another great visit from our friends from La Chaussée St Victor is over far too quickly. This year we are celebrating fifteen years of our Twinning Link. An excellent programme thoroughly entertained everybody who took part. A visit to Langham Glass gave us the opportunity to see the wonderful skill of the people there in making animals and birds in glass and also using glass blowing to make wine glasses. After lunch at Letheringsett Mill there was time for a visit to Holt for some shopping in Bakers and Larners. A trip to Davenports Magic Kingdom had everybody bewitched and bewildered with the amazing tricks (or is it really magic?). The evening saw us at Blickling Hall for drinks and canapés and a chance to walk around the garden. After a free day on Sunday we had our Celebration Dinner at The Links Hotel, West Runton. The final full day saw us at Oxburgh Hall, where a few brave souls ventured into the Priests Hole. That evening we had supper in the Town Hall. 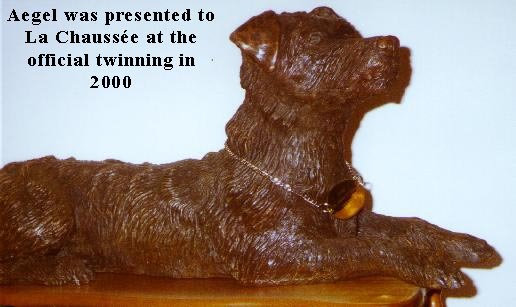 Once again the French won the Bowling For The Pig. If we do not win it back soon it will forget its mother tongue. Early Tuesday morning saw many bleary eyes and a few tearful ones as with much hugging and kissing we bade farewell to our visitors for another year. The return visit next year will be from Thursday 7th July to Tuesday 12th July. Another wonderful visit took place over the May bank holiday weekend. The weather started out in an unco-operative mood but when it realised who it was dealing with it bucked it’s ideas up. We started with a free day with hosts which after a long tiring journey was a relaxing way to begin the visit. Other highlights included a visit to a 12th century monastry with a picnic in the grounds and a visit ot the medieval city of Loches. We also had a boat ride on the Briare canal, which has the longest canal bridge in the world, with a delicious lunch on board. On the last day we had a barbecue in glorious sunshine. Our hosts challenged us to a tournament of Boule, their national sport, for the pig. Unsurprisingly we lost the competition so the pig will have to spend another year over the channel. The official dinner was in a lovely manor house which had been renovated and turned into a hotel. Many thanks to our French friends for such a marvellous visit. Also thanks to Chenery’s coaches and to Shaun our driver for a very comfortable journey. 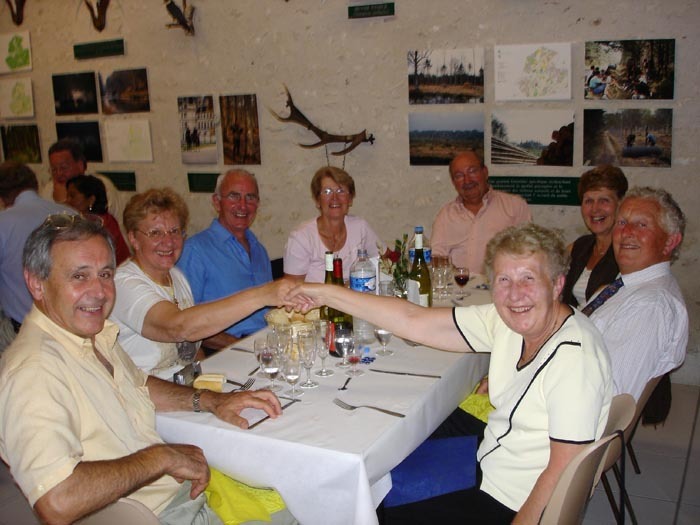 We welcomed thirty five guests from La Chaussée Saint Victor over the Spring Bank Holiday weekend when new friendships were made and ‘old’ ones cemented further. The Town Council hosted a reception at the High School when Eileen Springall, Town Council chairman, welcomed the guests. They then went off with their hosts for a quiet evening before the programme of events began. Friday morning saw heavy rain but spirits were not dampened as everyone rendezvoused at the Bure Valley Car Park to board the French bus bound for Sandringham. At Sandringham House the French friends were met by Jane, a French speaking guide. Saturday morning was free time with hosts, when many took the opportunity to visit Blicking, the Flower Festival and other events which were all part of Aylsham Festival. The afternoon saw a tour of Richard and Maureen Burr’s garden in Burgh Road, which was followed by a supper. It was discovered that two new members from France and a new member from Aylsham all sang in choirs and they led singing in both French and English. Sunday’s weather was perfect for a visit in the afternoon to West Lodge Gardens, which were opened in aid of the Royal British Legion. A Bank Holiday Monday river cruise on the Wensum down to Coldham Hall rounded off the weekend of trips. Rene and Mireille Agostini, visitors to Aylsham for the first time, said ‘Many thanks for the kindness and hospitality of our new English friends and we look forward to welcoming you next year in France'. A party of students from Aylsham High School travelled with us this year in order to spend time with the students of the local college. They had their own itinerary with the Blois school, and the thirty nine from the twinning went off with their hosts. We enjoyed a dramatisation of various historical events by the students of the College of Provinces in Blois, which is attended by many of the youngsters of La Chaussée St Victor. They acted out stories such the trial of Joan of Arc, having written the plays in English and then learning them. An absolutely brilliant effort by all of them. We also went to a dance and supper evening, with music by a local jazz band, and a sauerkraut supper, visited the Chateau of Ussé, an arboretum and a cave where we were treated to a charcuterie lunch and had the opportunity to purchase some wine to bring home. The final dinner this year was held in the Chateau of Fondjouan at Mur de Sologne, a lovely chateau-hotel in delightful grounds, and the students rejoined us at the end of the visit for the journey home. A party of forty travellers came to Aylsham with ten students from the College of Provinces at Blois. Lord and Lady Walpole invited us to Wolterton Hall and told us a little of the history of the house, much as they had in the early years of the twinning at their other house, Mannington Hall. We enjoyed lunch and a convivial afternoon in the rain at the Saracens Head, a visit to Fairhaven Gardens and a day at Thursford museum (later to be seen to have been described at La Chaussée as "a day of dreams"). A dance was held in the Town Hall in a similar format to our Old Year's Night events, with Barry Lee providing the music, and this years Celebration Dinner was at the Assembly Rooms in Norwich, with one of Sanders super-size double decker buses to ferry everyone there. 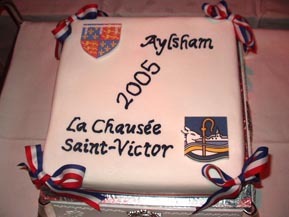 This year is the 10th anniversary of the Twinning with La Chaussée-St-Victor and to celebrate there were two visits, Aylsham to France in June and La Chaussée to England in August. We were in France for the Festival of Music, but were also treated to a visit to the Chateau at Valencay and a guided tour of Old Blois by the pupils of the Collège de Provinces. The Twinning Square was named and we took with us a signpost as a present for our twin town, which we look forward to seeing prominently displayed in the near future. Our visitors were treated to a seal trip from Morston, after a windy picnic, afternoon tea at Felbrigg and a visit to Holkham Hall, as well as dinner at the Great Hospital in Norwich. Our special guest was Baroness Shephard. We received visitors from la Chaussée over Easter weekend. The weather was kind to us, and we were treated royally by the RNLI during visits both to the Lifeboat station and the Henry Blogg Museum. Hot Cross Buns were of course obligatory. We also organised a walking quiz around our town, using it as an excuse to show off the sign boards showing our history, as well as many of our lovely buildings, and another walk along the riverside of Norwich. We were in France, to see the Chateau at Villandry, with its magnificent gardens and lovely interiors, and we were treated to a trip down the Loire on a Futreau, the traditional flat bottomed Loire sailing craft, the Loire equivalent to the wherry. We toured Blois to see all the work being done by the Blois Aggloplys, of which La Chaussée is part, and enjoyed an outdoor picnic in the grounds of the Basses Roches school. Two visits occurred in July this year, first it was the turn of our French friends to come over and enjoy our hospitality, and fifty five travelled to visit Canterbury and Cambridge en route to Aylsham, and then join us on our organised weekend. After a Friday evening reception at the Bure Valley Railway (many thanks to our Town Council for hosting it) Saturday saw the first visit of the weekend, to Weybourne station to begin a walk through Sheringham Park, and then on to the Sheringham station to board the steam hauled train to Holt, with coffee and scones on board. From there to a leisurely lunch at the King's Head at Letheringsett for almost ninety of us, and then a return to Aylsham because it was our Carnival evening. Sunday saw us at Oulton Chapel for an outdoor barbecue picnic lunch, our International Bowling competition during the afternoon (well done Alex), and the the superb performance by the Shining Lights to round the afternoon off, before returning to homes for a rest before evening meals en famille or au restaurant. Monday it was off to the Time & Tide Museum (via the Eels Foot Inn for coffee) for a visit, including an excellent buffet lunch, with a short walk around Great Yarmouth for those who wished it, then a return to Aylsham for a brief rest in time for the dinner for one hundred and seventeen at Pinewoods Country Club at Bodham on Monday evening. Later in the month there was a visit of seventeen from Ochtendung. Aylsham's relationship with Ochtendung still continues to be an informal friendship with a limited number taking part, and therefore still tends to be rather more a visit between friends that a Twinning visit. However it is based around our friendship with La Chaussée-St-Victor, and therefore it is important that we continue to develop the friendship, hoping that it will gradually grow. Our visitors were taken on the Broads, almost obligatory now, shown the fine city of Norwich and the Cathedral (by Waltraud Jarrold who hails from near Ochtendung), and treated to some real Aylsham hospitality. In the rotation of regular group exchanges, it was our turn again to go to La Chaussée, this visit coinciding with the Tenth anniversary of their twinning with Ochtendung. At the end of a busy but extremely enjoyable programme of activities, two hundred people sat down for the excellent celebration dinner, including thirty Germans and over forty from Aylsham. September 2005 Fifth anniversary return visit to La Chaussée. As the original Twinning charters were signed officially in both towns in the same year, it was agreed that the Fifth Anniversary of what has been a very successful project should be celebrated in both places this year. So about fifty went from Aylsham to La Chaussée in early September, at the time of the Foire aux beignets in France, the La Chaussée annual Doughnut Fair. Visits organised included a morning in Vendôme, the Cathedral at Orléans, the Commanderie d'Arville, an historic Knights Templar base, and the floral gardens at Orléans La Source. The dinner was held in a hall in the grounds of Chambord Chateau, and included the presentation to Aylsham Twinning of the coat of arms of La Chaussée carved in wood. The fifth anniversary is a good reason to have a celebration and a group of fifty five guests (including ten from Ochtendung) arrived on the 14th July to join their friends in Aylsham for a varied programme of event and functions, including a grand celebration dinner. Our French visitors brought over their theatre company, the Théatre de Mées, to perform French romantic farce written by Marcel Achard (who adopted La Chaussée as his home) called Voulez-vous jouer avec Moâ. There was another invitation for a small group to visit Ochtendung at the time of the Karnaval, and experience to be savoured we are told. Another group visit to La Chaussée by Aylsham Twinning saw a total of forty people enjoying the normal unsurpassable levels of friendship and hospitality. Visits were often underground this time, while we looked at mushroom cultivation in some of the disused galleries from which some of the chateau stone had been mined, a look at some troglodyte caves, and a dinner in a function room in yet another formerly disused underground gallery, this time having been brought back to life for wine storage as well as the function suite. During the dinner, Ivan and Lutkin were made Chevaliers, which, apart from giving them the award, required them to drink at least one hundred bottles of Touraine wine each year!! As a result of a visit in August 2003 of a small group of Germans from Ochtendung, La Chaussées's German twin town, a small delegation from Aylsham accepted an invitation to visit Ochtendung for the weekend of their annual Karnaval, a celebration on a huge scale including a procession of floats and up to one thousand fancy-dressed townspeople. Our French friends were in Aylsham again, nearly seventy of them, for the bank holiday weekend and the Aylsham Show, and were welcomed into the homes of Aylsham Twinning members for the second or third time in several cases. Among the party were members of the la Chaussée Vintage Cycles Club who gave two displays at Aylsham Show as part of the Show programme, dressed in period costume appropriate to the age of their bikes. In typical show business style, Mauricette Martinez rode her machine despite slipping on the boat to the seals at Morston the previous day and injuring her leg. Nearly thirty members travelled to La Chaussée to share their European Days which celebrated the diverse cultures of the fifteen member states of the EU. A similar group was there also from Ochtendung, their German twin town, plus individuals from most of the other European Union countries of the time (prior to further enlargement). The Aylsham group was joined in La Chaussée by members of Aylsham Flower Club who went there to contribute floral displays as part of their own fiftieth anniversary celebrations. A group visit to our twin town was made by sixty enthusiastic twinners of Aylsham, some of them for the first time but many returning to revisit and stay with friends they had already made. Many of them had enjoyed private visits in the meantime, one way or the other. We welcomed a delegation of seven Chausséens, invited to represent their twinning association and their town to come and join in and share the fun of Aylsham's Golden Jubilee celebrations. A party of forty seven come to Aylsham from La Chaussée, including fifteen who had cycled the five hundred miles from the Loire Valley to Norfolk over six days. They were met at Dover by a keen Norfolk cyclist, John Woolnough, who cycled with them back to Norfolk, and they were met by Norfolk cyclists, including a few Aylsham Twinning members to guide them the last few miles home. This was followed by celebration in typical twinning style, including a dinner at the Aylsham Lodge Hotel. A group of forty six people, more than half of them new visitors, came to Aylsham for the first informal exchange since the official twinning the previous year. A group of sixty three Aylsham people went to France on the return visit for the corresponding twinning ceremony there. Since then the link has gone very quickly from strength to strength with interest, membership and involvement growing year on year. The first formal twinning ceremony took place at the Aylsham Show, attended by a party of fifty from La Chaussée. The official ceremony was in the grand ring in boiling hot sun, an omen for what was to become a very sunny and bright link between two special towns. A similar group from Aylsham paid a return visit to La Chaussée as a result of which firm friendships were quickly established in a very welcoming town in a lovely area of France. Four representatives from la Chaussée, including Madame Maire Jacqueline Gourault, visited the town and were delighted by the town, the area, the people they met and the warm welcome they received. The Aylsham Twinning Initiative was formed at a meeting at Aylsham High School attended by only seven interested people. The Initiative quickly gained momentum and after a lot of fact finding work, plus the normal formal overtures, contact was made by La Chaussée-Saint-Victor, near Blois on the River Loire, circumnavigating the red tape by a direct telephone call because of previous difficulties they had had with the twinning "bureaucracy". © 2013-7 Rubicon Systems Limited. All rights reserved.